Providing you the best range of titanium agitator, titanium dual mixers, titanium impeller and titanium stirrer with effective & timely delivery. Uniforce Manufacture agitators, stirrers, and mixers that are suitable for most corrosion resistant applications. We supply agitators, stirrers and mixers from laboratory application to process applications to fit into the Process tanks, Vessels and Reactors. We offer a wide range of these products according to customer needs. 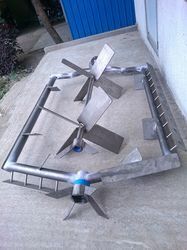 The range includes blade agitator, double helix agitator, anchor agitator, laboratory agitator and helix agitator- propeller type agitator, static type stirrer, high shear type agitator, flat blade paddle agitator, paddle type mixer, paddle type stirrer with curved blade,paddle type agitator with pitched blades. We manufacture and supply Titanium Agitators for variety of applications to meet customer specific process demands (suspension, dispersion, emulsification, blending, pumping, dissolving, absorption, extraction, reactions, heat transfer). Compliance to any Exotic Metal series as material of construction required by the application. Titanium impeller fabricated from ASTM B 265 Gr.2 ( Commercially pure grade ) to be used in potassium Chlorate manufacturing plant. 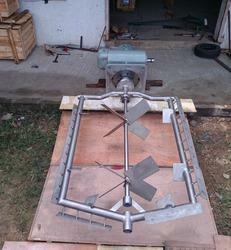 Titanium Stirrer made for Chemical Mixing Tank in Chlorate Manufacturing unit.